dreams of playing in outer space, and how to construct the perfect burger. When I listen to Tashaki Miyaki I'm reminded of home. I can't separate their music from the concrete, palm tree-studded landscapes of Los Angeles or the sandy beaches of my native Orange County, and the seemingly endless highways that connect all of it together. Dreams of warm, hazy days spent driving on the 101 freeway with the one you love while listening to your favorite song come to mind; hands interlocked, smiles abounding. The vast, blue sky envelopes you with warmth and comfort as you soak in the beautiful sun. Tashaki Miyaki makes music for those joy-filled days of youth that feel like they could last forever. THE LE SIGH: The cassette you released this March through Burger Records originally came out on vinyl a couple of years ago in the UK. How does it feel to finally have your songs officially released in the US? Rocky: It's very cool that the folks out in the UK first discovered our music. We've had the opportunity to go tour over there a couple times in the last year or so but we're an American band so to finally put the stuff out here is really satisfying. Lil D: It's awesome to be part of the Burger Records family and have this new release spread awareness about the band. TLS: You have alternative versions of songs that you've written and in interviews you've mentioned that you're inspired by artists of the 60s and 70s who incorporated that same practice. What are some of your favorite songs with alternate takes? L: I love the demos for Loaded, especially "I Found A Reason." There's also some sessions with Bob Dylan and George Harrison that I love where they're just playing together at Columbia Studios in NY. I love their version of "I Threw It All Away." And I love Uncle Neil's version of "Birds" on the archives box set. It's different from the record version and very groovy. R: A lot of bands we like have a bunch of different versions of their songs. I guess it's just natural to us to do that kinda stuff. It's always cool when you find another take on a song you've loved forever. LD: It's fun to do acoustic interpretations of the songs with our friend Doc on cello especially on "Keep Me In Mind" and "Get It Right." TLS: You're working on a new record which will include a 17 piece string section. That sounds amazing and quite different from what Tashaki Miyaki has released in the past. How is that going? Any news on a release date? L: I think it's 16 pieces and it's on about half the record. One song has a quartet. It's moving slower than we would like, but we are financing it ourselves, which I'm happy about as it gives us complete creative freedom, but has slowed down the process a bit. It will be done very soon. The string arrangements are beautiful and we're all very excited about it. It's my dream to play with a live orchestra. TLS: If you could play a show anywhere, no matter how unusual or unlikely the location seemed, where would it be? L: We'd like to play in the parking lot of Tang's Donut on Sunset or the rooftop of the KFC in Echo Park. It's a band dream. Personally, I'd love to play The Wiltern. The first concert I ever saw was John Prine at The Wiltern with my Dad. R: Open for the Stones. LD: I think a show on the International Space Station would be quite memorable. We're all collectively inspired by space and the cosmos but performing in Tokyo has been my dream for a long time. TLS: What's your favorite thing about California? L: The weather and the vibe. LD: Mellow weather and beautiful scenery. R: It's all I know. Are other places not as fun? TLS: Describe your perfect burger. L: Not too massive of a soft sesame bun, quality organic grass fed beef patty, grilled onions, dijon, avocado, iceberg lettuce, and fresh tomato. R: May involve an avocado. TLS: What have you been listening to lately? L: I've been listening to lots of Big Star, The Rain Parade, Sparkle Horse, and the records I've been recording for other bands (LA Witch, Cherry Glazerr, and The Aquadolls). R: Just picked up a compilation of Arnold Schwarzenegger movie soundtracks. Terminator, Conan, etc. Pretty awesome. LD: Little Roy's reggae covers of Nirvana songs. 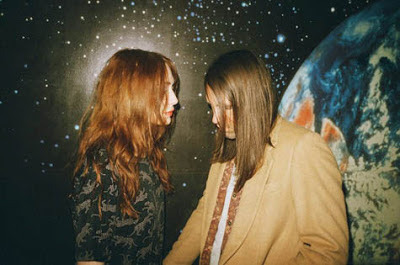 Listen to Tashaki Miyaki on bandcamp. Gabrielle Costa, a student from Southern California. She believes that beauty can be found in the most unlikely places and that every person's story counts. In her spare time she can be found reading, writing, picking flowers, and broadcasting music on the radio.